In the years following the US Civil War, roller skating really came into its own. As the design of the roller skate improved over the second half of the 19th century, so did its popularity. Many became fans of the new hobby. Many others viewed it as immoral and a threat to the order of things. 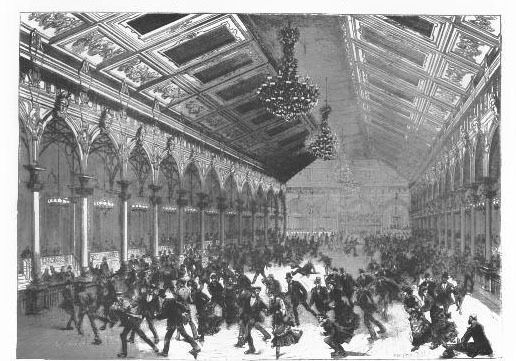 By the 1880s, a craze had developed, and roller skating rinks began opening in many US cities. Boston had three. The largest, on the corner of Clarendon and St. James Streets in the Back Bay neighborhood, featured a roller skating surface some 180 feet long by 70 feet wide. Two others were in Boston, at the time, one on Washington Street, near the intersection with Dover, in the South End. Another stood on Shawmut Avenue. The Lowell Skating Rink was located on Gorham Street, and opened each year in November, right before Thanksgiving. The season extended through April and sometimes until the middle of May, when the rink closed and skaters took to skating on the smoothest sidewalks and roads to be found in the city. Sometimes, the rinks were also used for bicycles, bouquet parties, and competitive skating competitions. 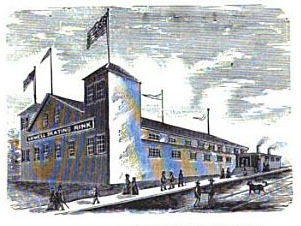 For a while, the Lowell Skating Rink even hosted the games of Lowell’s polo team. Despite its popularity, many saw the skating rink as a “bad institution” even it all it did was keep society’s most vulnerable, the young, out too late at night, or provide them with a plausible cover when they went elsewhere. Inside, the rink was known not only for its yellow birch skating floor, but also for its ornamental railings that separated the skaters from the fifteen-foot-wide promenade. From the promenade, spectators watched skaters from their rows of camp chairs. The editorial concluded by claiming that roller skating could not “help having immoral effects” even if the management of the rink was sound. The long-ago writer also claimed that roller skating was the “most mischievous form of public amusement ever introduced” and believed that it would soon be “suppressed as a dangerous evil.” In the end, roller skating was not suppressed, and actually evolved into being seen by later generations as good, clean fun. The Lowell Skating Rink would not live to see the vindication of roller skating among the masses, though. It closed its doors in early 1885, and was sold and torn down soon after.